Oct. 14 2015 about Disney's Halloween at TDS. Sep. 22 2015 about Disney's Halloween at TDL. Aug. 08 2015 about Special Summer Event at TDR. Aug. 01 2015 about Duffy's Blur Anniversary at TDS. Jul. 05 2015 about TDL Egg Hunt in June. Jul. 04 2015 about Foaming Hand Soap in TDR. Have you prepared your costume for Halloween already? Please give me some minutes and let's check so popular TDS Halloween. 2015 TDS Halloween is themed on Disney villains. How many the villain or motif do you find in this main art? I really love the Dr. Facilier's voodoo pendant. Under this facade decoration, there are another main art columns. It's illuminated and changed the color in the night. Don't forget to check both side of the column. Then you can find cool graven scene from "Night on Bald Mountain". So go under the marquee. There are beautiful banner in the corridor to the main harbor. Can you see the two aspects? Seeing from different position, these Disney friends changed to Disney villains. Mickey to Captain Hook, Minnie to Evil Queen. Donald to Hades, Daisy to Ursula. Goofy to Jafar, Clarice to Maleficent. So let's begin to Disney Villains knowledge quiz! How many villains can you tell from these banners? You can see 1 & 2 so easily. 4 is a main villains at one and only and closed attraction in TDL. 8,9,10 are also easy, aren't they? 13-15 is a family, right? 21 bird may leads you mistake, so don't focus deeply the armorial bird. He uses Hayabusa. The banner is so elegant, but he's far from it. Let's move to a main photo location of this special Halloween at TDS. The very center of the photo location has a big 3D villains frame. There are cute Goons pumpkins an underneath of the frame. And above, there is a Diablo the Raven! I like it. Beautiful staind-glass-like decoration. This place is really popular to take a photo. And we can enjoy so many Halloween special menus. Many of them are themed on Disney Villains. Pete's hut is sold "Black Kouign-amann". The wrap paper of the sweet purple potato pastry is Maleficent that is so popular, and need to wait in a long queue line. If you want to see massive Jafar artwork, visit the Casbah Food Court the counter-service restaurant. Great Curry with amazing turban like dessert! Sailing Day Buffet the restaurant is now preparing Villains Halloween Party special menu. And there are also “henchman of Disney Villains” meet & greet in the dining. Unfortunately I haven't eaten here because of soooo long queue line, one day was 250 minutes, and one weekend was 360 minutes. From the googling, the henchman of Disney Villains named "Malfi"(henchman of Malficent. ), "Mr. Dalmetian", "Farja"(henchman of Jafar. ), "Lady Scar" etc, they might be INSPIRED by "Descendants" the movie. (Honestly speaking, I bet they didn't know the existence of the movie.) And little odd thing is they respond to requests from the guests for their autograph! Don't worry I don't forget about Duffy and Gelatoni thing. 2015 costume of Duffy and SherrieMay were designed by Gelatoni. These costume for Duffy bear and SherrieMay bear are really sold in TDS. Anyway TDS Halloween is so busy and fun, join in! It's most wonderful and exciting time for me has come. Yes, it's Disney's Halloween! In this year, this special event will keep going on until 1st November which is Sunday. Unfortunately, the very first week of Disney Halloween was almost raining, one day was typhoon. So sorry for most of my pictures at the park are darkish or with lots of rain drops. But I hope you'll enjoy and feel the park's special atmosphere. Maestro Donald, and Diva Daisy on the tractor. At the hub, there are Halloween Dance Party with many ghosts. Don't rain on their dance any more! The "Halloween Harvest" the special day parade went through this heavy rain. It's happy to see Disney friends with high transparency raincoat. See you again in sunny days! I couldn't take a photo of Donald at the parade, so I shared him at the shop window. We can still enjoy the special photo location in the dark. I admit these pancakes are so mouth-watering food. But it's not Hawaii, it's a Halloween, so I'd like to eat more something not like a morning things. These are great and perfect treats for Halloween! Prepare your Halloween costume? So let's out Halloween tonight! It's a middle of summer, TDR have a special event which called "Natsu Matsuri" at TDL and "Summer Festival" at TDS to 31. August. We can check two cool and hot team of the dance contest in "Garyo Gunbu" the main show in the special summer event. During the event, we can see many Japanese character or Kanji in TDL decorations. More cool decorations from window of "Emporium" in World Bazaar. "Garyo Gunbu" is Japanese which means nonsense word itself, which expressed Japanese Classic elegant and cool and dance with many people. So you'll understand how feeling of the show. The main part is performed before the castle where seated an allotte guests by the lottery. So if you'll lose the lottery, you can see like this. The above woman is show operator. She never stir an inch under this heavy water. She's professional! So, I'll win the show lottery in next time, so now I introduced some special photo location. During the show, you can take a good picture at these popular photo places. Let's check Disney's Summer Festival at TDS. The corridor to Mediterranean Harbor from entrance have the special event banner. This event hostess is Minnie and pretty ladies, with Daisy and Clarice. Clarice is so popular in Japan, it's very rare opportunity for other country people to see many decorations and merchandises of Clarice. Ms. Stacia Martin who is Disney Artist and Historian love Clarice too. Before the "Mamma Biscotti's Bakery" the pastry shop, these colorful umbrellas are a sign of special table of the special summer event. Boys and rare character Clarice. Of course, there are Minnie and Daisy tables! TDS Summer Festival celebrates tropical fruits harvest, we can see many colorful fruits decorations in the park. It's time to dance and soak at "Minnie's Tropical Splash" the special harbor show. The big tropical barge with Daisy, Clarice, and Minnie. And decorated Transit Steamer Line bring Mickey. Under the bad weather and heavy rain, we love soaking BY the SHOW. But most wonderful is get wet under the sun! Beyond the water curtain, Mickey is there. Get Wet and Celebrate the tropical fruits harvest in this summer! TDS has a festive event called as "Journeys with Duffy -Your Friend Forever-" from 3 July. The concept is; It's ALMOST 10 years of Duffy's debut, so time to celebrate our precious memory with your friend Duffy. There is no parade or show of this, but various and many special merchandises have launched for this event. Of course, we can enjoy special decoration at Cape Cod area. Let's stroll around the bustling port town which was once a quiet sea village. There is a big Minnie photo location as a sigh of thanks. Inside a dining area of Cape Cod Cook-Off Restaurant was decorated with Mickey and Duffy's memorable log. "I was getting ready to set sail on a long voyage. Minnie made me a teddy bear to take with me so I would never be lonely. The bear with duffle bag, so I named him as Duffy." "Minnie, Thank you!" The exit sign is also Duffy. Say good bye the above Duffy on the exit, let's go and see a monumental statue of CapeCod. Duffy Join the famous Helmsman Mickey statue! This statue also symbolic figure of Magic the Disney Cruise. What do you think if the Duffy will also join the Helmsman Mickey statue at Disney Magic? Finally on 23 June, a long TDL Easter event was over. So let's check June Egg Hunt the fee-charging game. This Egg hunt for an expert is changed the hidden place of eggs in every month. The expert course is ¥1,030. We followed the short messages and pictures as a clue which painted by an Easter bunny. Message 1. Look up at a balcony. Message 2. Can see a distant castle from me. Message 3. Come on a dock. Message 4. A wagon with full of instruments. Message 5. A water is free! The clue of picture 1 which can see "cafe" with grave accent give me an hidden area. Then reading clue message 1, we have to check the high above. There are parrot egg in a cage at a balcony. The picture 2 looks like a tail of a car. 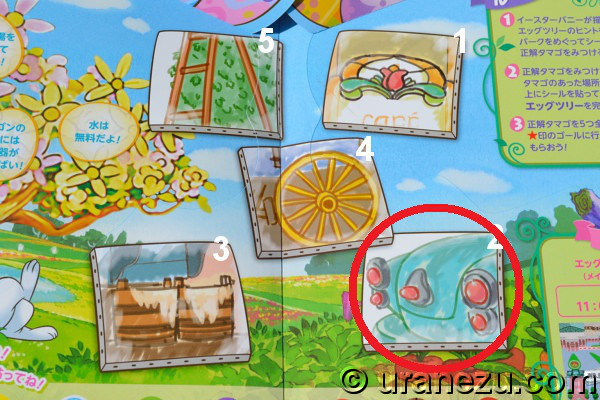 And we can find a modern car only at Tomorrowland or Toontown. But the message 5 is recalled me a some place in Toontown. So let's go and check it there. Yes, we can find exactly the same car at Toontown. And find the free water station next to the car. But wait, where is a hidden egg? Well done to put it in the water tank. We can guess "Tom Sawyer Island Rafts" or "Mark Twain Riverboat" from the message 3. And I really know the bucket of picture 3. This is the dock at "Tom Sawyer Island Rafts" in Westernland. But wait! I remember this egg! I think it's the first time second-hand egg. 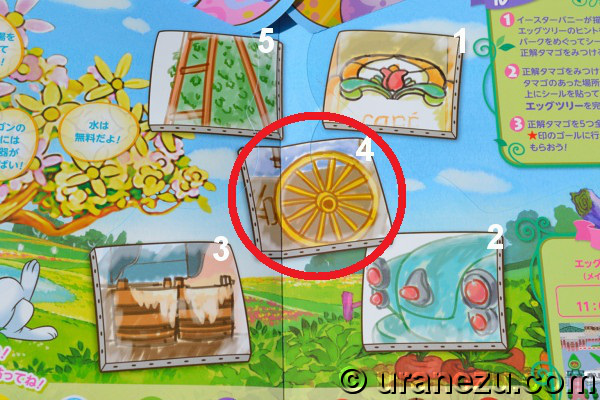 Following the picture 4 and ,message 4, we'll find a hidden egg around "Country Bear Theater" in Westernland..
Let's look into the wagon. Oh, that's cute egg, it painted Earnest's fiddle pattern! It's simple but great choice of hidden place and egg design. So this is the last hidden egg place, seeing picture 5 looks hedge with something wooden things. There are some tidy hedge in Fantasyland, so let's explore there. I see! This is the place the last hidden egg! It's a ladder of working tramp. And this is the distant castle of message 2. He painted a white rose to red enthusiastic. But not only a rose! The guardian watching you, be careful! We found all hidden expert eggs! Take a bag charm as a reward for Expert course. Mickey is in April reward, Donald is May, and Minnie is June. TDL Splash Mountain has no sponsor for almost 9 years since end of Nissan Motor Co., Ltd. On July 1st 2015, a new company support this attraction. The entrance board have the name of company "Kao" in white letters. Kao is a chemical and cosmetics company. So from this day, a new fun (?) spot was added at Critter Country. It's a hand washing zone. Disney lovers never feel tired about queing up. The opening day is rainy, but many guests waited to washing their hands at this newest sink. But I couldn't wait. And I wanted to go to restroom at that time. So I gave up it, and go to nearest bathroom. Luckily, I found a new dispenser at there. I really want to know your honest opinion. The company also become a backer of "Toyville Trolley Park" with "Toy Story Mania!" at TDS. Lots of people waited to wash their hands in the rain at TDS either. It's very hot topic and many guests rush to this two new place. But I'd like to re-introduce another amazing and venerable hand wash sink which has welcomed many guests. The great sink is located at "Nautilus Galley" the snack counter in Mysterious Island. Is it beautiful? The area is lava cave near the Nemo's Nautilus submarine. So he may also designed this sink. So this is the nice opportinity to visit the sink at Mysterious Island!